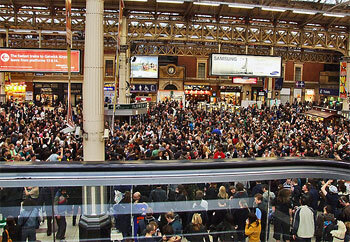 An iPod flash mob party took over London’s Victoria Station Friday. An estimated 4,000 dancers turned up for the spontaneous event before four vanloads of police moved in to break up the gathering. The Victoria Station flash mob started at 6.53pm. 4,000 partiers did a 10-second countdown before the scheduled time and then erupted, dancing for two hours until the police arrived.